This is the first of a soon to be occasional series of posts on the Best Portland Blogs You’re Not Reading. Periodically I visit each of the blogs on my blogroll (which you’ll find just below the ads on the right). Many are popular and well trafficked, others are infrequently updated, but contain some gems. And then there are the ones that are almost always well written or entertaining, and routinely updated, but don’t get the traffic, I think, they deserve (I have some not so nefarious ways of determining this, e.g. open Sitemeter stats). You probably know Portlander Bart King as the author of the tomes The Pocket Guide to Brillance, The Pocket Guide to Mischief, The Big Book of Boy Stuff, The Big Book of Gross Stuff, and several more books in that vein. Oh, he also wrote An Architectural Guidebook to Portland. Yes, he’s got some range. And he blogs at Unexpectedly Bart. It’s a Segway for Ninjas! What Does an Author Smell Like? 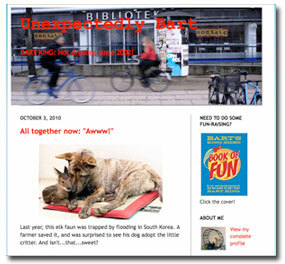 Unexpectedly Bart serves as a repository for Bart King’s always amusing takes on random internet memes, Boing-Boing-esque curiosities, absurd news headlines, and the writer’s life. Most of the posts take the form of Bart rifting succinctly on silly YouTube videos or photos from news stories. In my opinion, Unexpectedly Bart is one of the Best Portland Blogs You’re Not Reading – go read it! I look forward to additional posts like this one. Thanks Lisa – I’ve got a few more posts like this in the works! Check out my blog, tales of life in Portland. Our interests include collecting taxidermy, cooking, reading and low brow art. We also have a new baby, Hank.